Are You GDPR & Breach Ready? The GDPR mandates that organisations must inform the relevant regulatory authorities on certain types of personal data breaches. You must do so within 72 hours of becoming aware of a breach. 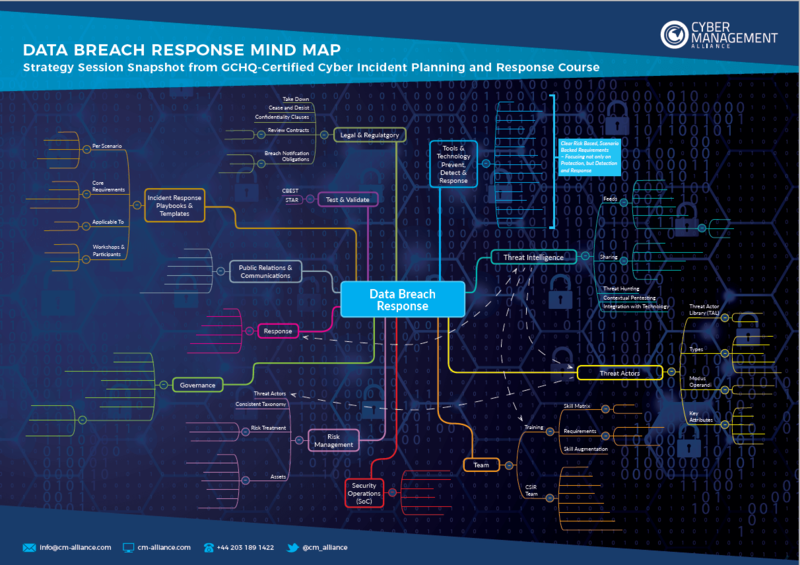 This mind map, taken from our GCHQ-Certified Cyber Incident Planning and Response course, outlines several areas that an organisation must focus on to be GDPR breach ready and offers various pointers to construct an effective cyber incident response plan. Not only GDPR but also major cybersecurity standards such as ISO 27001, ISO 22301, PCI DSS recommend organisations to develop a Data Breach or Cyber Incident Response Plan. ** GDPR & Privacy ** We wholeheartedly believe your and our rights to privacy and in the GDPR. The bottom of the page explains how we use your data. Inform you about upcoming and FREE educational webinars on GDPR and Cybersecurity. Inform you of upcoming courses including Data Breach Response or Cyber Incident Response training. Offer you advisory and support on achieving cybersecurity and privacy. A GDPR resource to help you create a defined data breach response process.